Like I need an excuse to use this gif. Just imagine the ice cream is ratings! 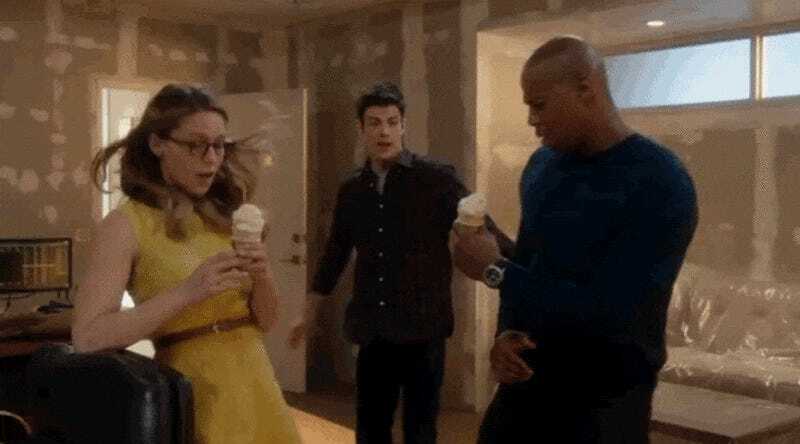 Supergirl rocked the CW’s airwaves last night with its (excellent) sophomore season premiere, apparently delivering the CW’s most-watched episode of TV in the show’s 8pm slot since a 2008 episode of Gossip Girl with just over three million viewers. You could even say the result was... super. An impressive stat, but one that makes sense—after all, Supergirl was broadcast to a much wider audience on CBS for its first season, so the fact that a good chunk of its audience migrated over to the much smaller CW isn’t too surprising. The show’s premiere was half of the six million that watched the season one finale, but for a network like the CW, even a 50 percent drop is enough to make Supergirl one of its most-watched shows. Ice cream for everybody!